We added Bit.ly link shortening to our Crosspost publishing tool. Now, every link you insert into the Crosspost dialog box will be automatically shortened with Bit.ly. The Bi.ly link shortening feature is turned on as a default setting. To make the most out of the Bit.ly integration, you should connect your own account. By connecting your own account you will have access to analytics of everything you Crosspost on your own Bit.ly page. To access the settings and configure your own Bit.ly account, click the Publishing tab on the top of the Symphony dashboard. From there, select the “Options” button. Integration with Bit.ly makes your messages look cleaner and provides analytics. Connecting your own Bit.ly account will also save you time by not having to go outside of the Crosspost publisher to shorten your links. If you don’t want to shorten your links, with one click you can toggle the feature on and off. Crosspost is the power tool of social media publishing! You can download the free Crosspost Chrome extension here. 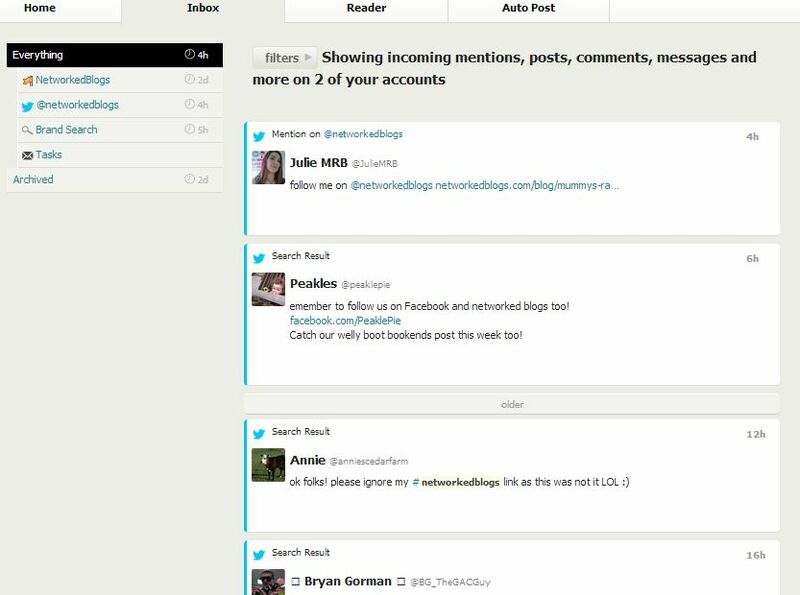 Symphony Crosspost, the publishing tool within our suite, lets you share your blog posts as big pictures. Different than copy-pasting your blog link directly into Facebook, which shares the post as regular link along with a thumbnail picture, Symphony publishes the link as a big picture and adds the text in the caption. Bloggers understand that their blogs need to be interesting and engaging in order to attract and retain readers. While it is the content and context of each blog post that keeps readers coming back, adding images to accompany each post is an important part of attraction. The same principles apply to using social media to attract readers. Social media is all about headlines and images. If both are not unique and/or compelling, no one is going to click on them to read more. On Facebook, considering their updated news feed algorithm, if your posts aren’t drawing engagement, it’s actually better not to share them at all. But that’s a different conversation altogether. People are more likely to click on a post with a picture than one without a picture. People are also more likely to click on a big picture that a small one. 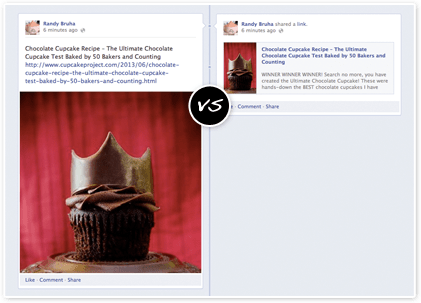 Sharing your blog as big pictures on Facebook can help increase your click-through-rate (CTR). Because we know writing strong, sharable blog articles take considerable time, we made adding the pictures incredibly fast. If you haven’t found that perfect image for your blog post yet, but still want to get it out on social media, our tool will suggest a picture for you based on the content. Spend your time writing great posts, not figuring out how to share it on social media! Give Symphony a 30-day free trail and watch your readership grow. We just added a plan called Verdi. We created the Verdi plan specifically as a way to better cater to individuals who are only interested in publishing content and sharing their blog on social media. The Verdi plan is $14 a month. What is the Verdi Plan? The Verdi plan is designed for power publishing on social media and offers users the ability to connect up to eight profiles and blogs. The publishing feature, called Crosspost, has a built-in image search, an image editor, integration with Dropbox, and scheduling and queuing. The plan also contains the Facebook tab feature. 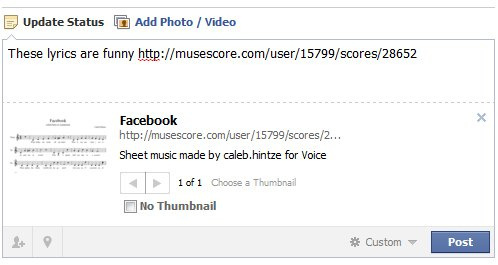 In a few easy steps you can add your blog as a tab to Facebook and automate social media publishing. 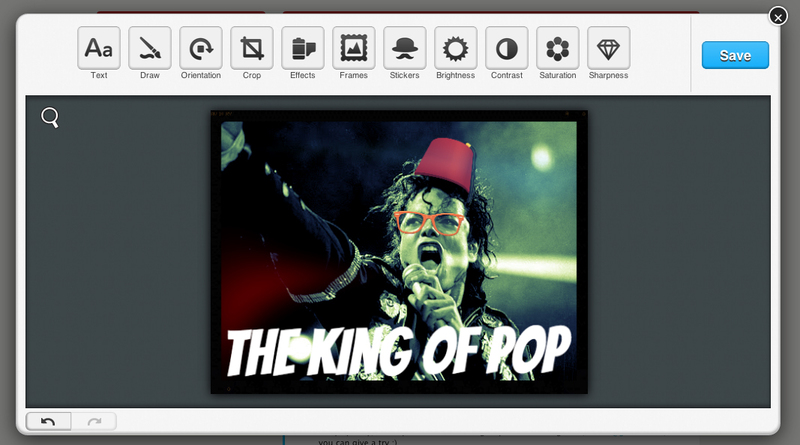 There are multiple templates to choose from to make sure your blog pictures are displayed the way they should be – BIG! Missing from the Verdi plan are the features for monitoring and replying as well as teams and collaboration. Compare features and pricing from all three Symphony plans here. Is the Verdi Plan for Me? Sharing content on social media is important for businesses, bloggers, hobbyists, and everyone in between. Verdi is the perfect pro-consumer solution for social media publishing and blog sharing. If you are moonlighting as a photographer, running a fashion blog, promoting real-estate listings, running a fan page for gamers, or you just like creating and publishing unique content for social media “just because”, the Symphony Verdi plan is for you. 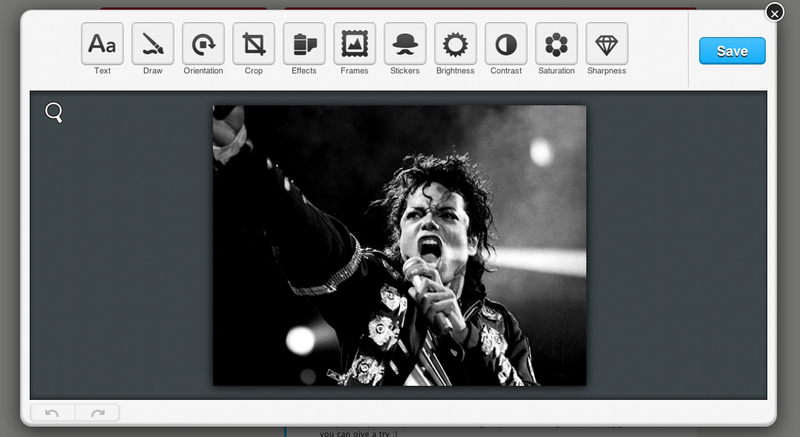 Turn your passion into great visual content to publish on social media with Symphony. Do you think you could fully describe the majesty of the Grand Canyon to a stranger who has never seen it in less than ten seconds? Most would agree that ten seconds would not do the Grand Canyon justice. Studies have shown that on the Internet, you have a mere three seconds to capture a viewer’s attention before they move on. Like trying to describe one of the seven wonders of the world to a stranger in ten seconds, it would seem just as impossible to convey all the benefits of your business in three fleeting seconds. To be successful in the crowded social space, you must find ways to capture your viewer’s interest and give them a reason to want more. In mere seconds, your potential customers must be able to see the benefits and values your business or service is offering. Do your social posts pass the blink test? While certainly quick and accurate, none of those words alone, however, can truly describe what they really look like. Would anyone use the word “awesome” to describe their entire business model to someone who had never heard of it before? The solution to the attention war is the same today as it was hundreds of years ago. Combining strong visuals with the right text helps show what makes you or your business special. According to published research by Princeton University, people form an opinion on whether they can trust someone in one-tenth of a second. Likewise, you have three precious seconds to help your visitors make a decision on whether or not they feel comfortable enough with what you are offering to give you more of their time. Posts that embrace the “less telling and more engaging” method have proven to be the most effective way to earn trust (even if it’s short lived) on social media. Make sure you are winning the social media attention war by using strong visuals that complement your message. Businesses need pictures to help show why they are awesome. Symphony is the best tool for using pictures to say what words can’t explain. You have three seconds. Use them well. PS – We just released a big update. 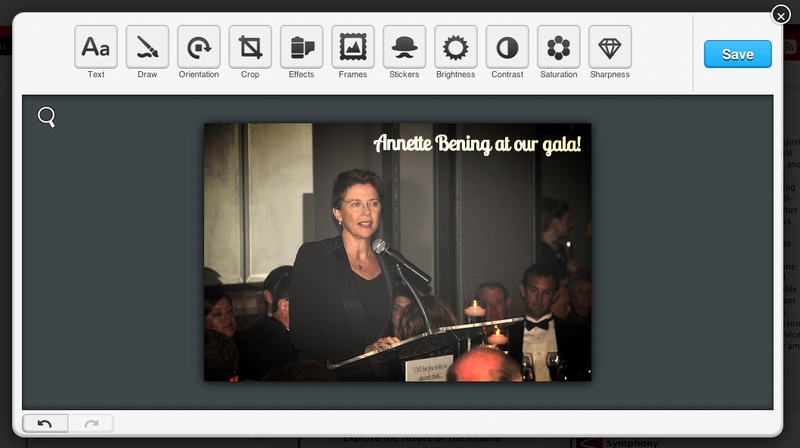 Now you can edit images in our publisher. Read more about it here. 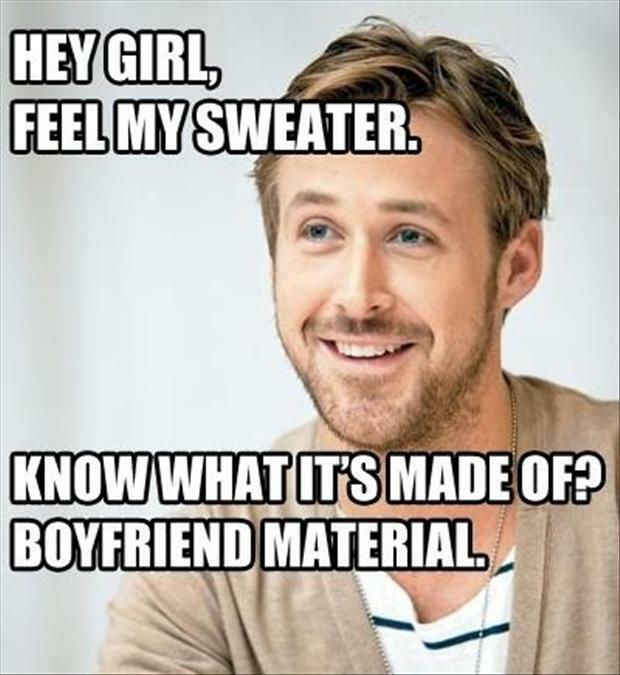 Publishing Images Got a Whole Lot Awesomer! A tool designed for publishing beautiful content is at your fingertips. Added to the drag-an-drop and built-in image search features, the Symphony publisher now has the ability to connect directly to your Dropbox folder and edit your images! Photoshop skills? Who need ’em! Eliminate wasting ungodly amounts of time scouring the web for the perfect image to publish. The built-in image search suggests an image for your post based on what you write. All of the suggested images are public domain and creative commons. This is 2013, who has time for downloading and uploading anymore? It’s ok if you aren’t a photoshop wiz. You can edit the photos you want to use right in the publisher. You can add text, filters, graphics, draw, and more. Quickly add your own flare to any image and make it unique. Create a new meme, add a hashtag, display your company’s url, highlight specific parts of an infographic, put a funny hat on a picture of your CEO… the options are endless! Grab your own photos from the cloud! The Dropbox plugin lets you use photos from any of your folders right within the publisher. If your mobile device is synced up to your Dropbox account, you can snap a picture of your coworker sleeping, add a great caption, and share it with the world! We just released another update to our social media dashboard – LinkedIn integration! Now you can monitor, manage, and publish to your news feed and groups from one place. Here is a quick overview of the new features. 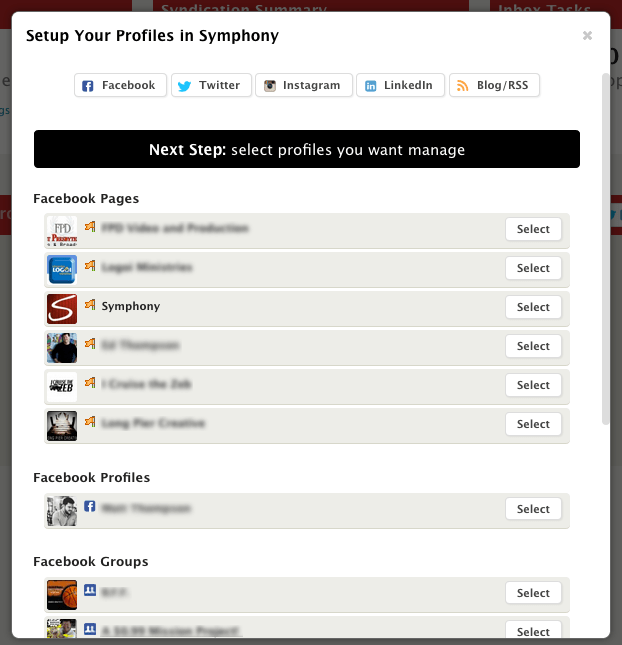 The first step is to add the profiles and groups you want to manage through Symphony. Do that from the home page by clicking “Add Profiles & Blogs”. We wanted to make reading and interacting with multiple groups as streamlined as possible to save you time and effort trying to keep up. 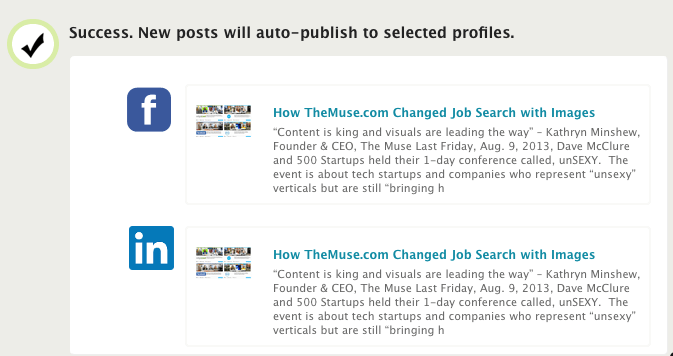 You can create a “new post” and Crosspost immediately to each place in LinkedIn you would like. The Symphony Reader allows you to view and interact with all of your connections and group members from one single page. From the Reader you can “Like” and “Comment” on news feed and group posts. Don’t bombard your connections with a flurry of back-to-back posts. Add LinkedIn posts to your queue and have your messages go out throughout the day. Every time you Crosspost, you have the option to “Post Now” or “Queue.” Clicking on the Queue button adds posts to your calendar. 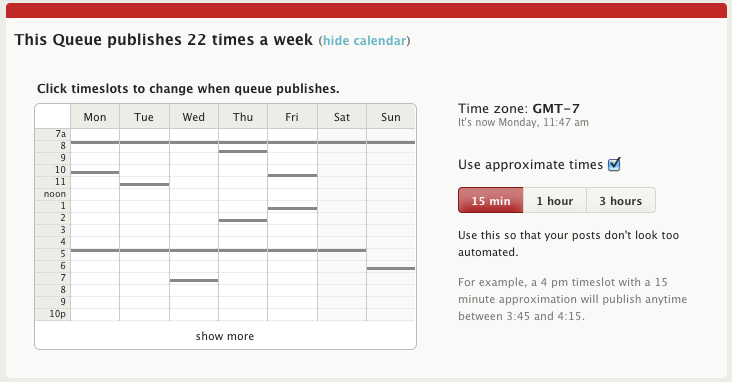 To add and change the times on your publishing calendar, go to the Auto Post menu. Once there, select the LinkedIn group you manage and add more scheduling times and days. 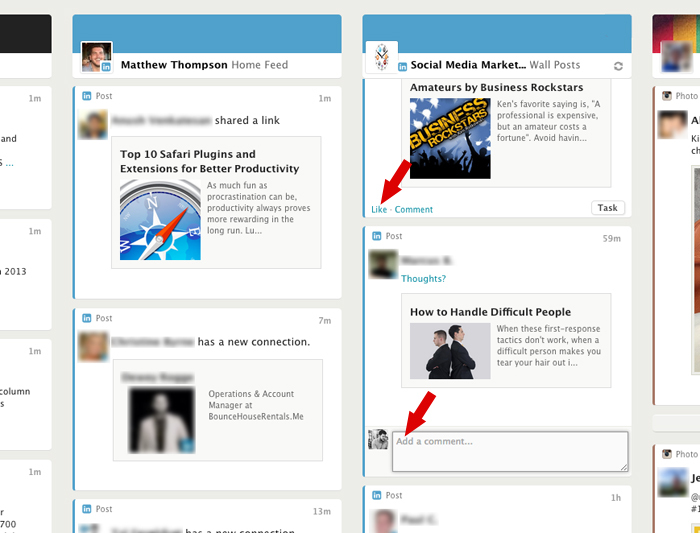 There’s no longer a need to manually share your blog to all of your LinkedIn groups. 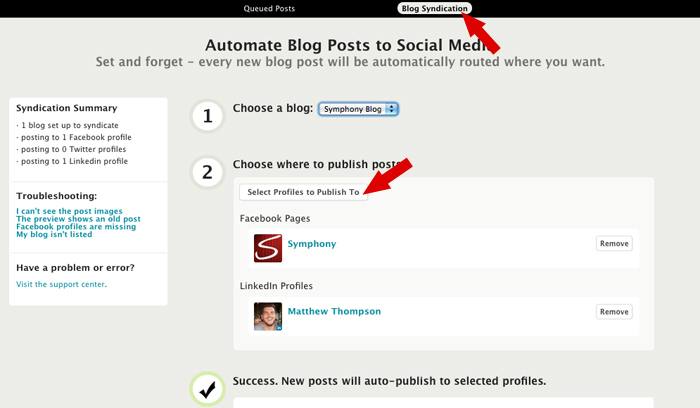 Set up the automated blog publishing option in Symphony and as soon as you publish your blog posts, it will be shared on LinkedIn. Go to the Auto Post menu and then click on “Blog Syndication” to get started. Select the group/s you want your blog to automatically publish to. You can select to auto-publish to your profile and the groups you’re an admin of. Using Symphony to manage your LinkedIn account will change the way you engage with your connections. Start sharing your content with professionals in your field. On Tuesday, Facebook announced an update to its news feed algorithm and finally answered the mysterious question of “how the news feed actually works.” The concept behind Facebook’s news feed update is simple – the posts with the most likes, comments, & shares will be displayed more frequently in the news feed . Lars Backstrom, the engineering manager for Facebook’s News Feed ranking, said “The goal of News Feed is to deliver the right content to the right people at the right time so they don’t miss the stories that are important to them. Ideally, we want News Feed to show all the posts people want to see in the order they want to read them.” Facebook performed a recent study that found that this new ranking system led to a 13% increase in stories read, and a 5% increase in interactions (Likes, shares, comments). The purpose of the updates to Facebook’s news feed is to highlight stories users find most interesting. Story Bumping allows for the stories you may have missed in your news feed earlier in the day, a chance to be displayed to you later on, if that story is “popular.” Before the update, every time a user refreshed their feed, all the newly created posts were automatically moved to the top. The Story Bump process now enables the older posts (stories that may have been posted earlier but never actually scrolled through) to join the new stories at the top of your feed. Another change to the algorithm, Last Actor, looks at the 50 people you most recently interacted with on Facebook – such as viewing someone’s profile or photos, and liking their stories. If you spend the morning looking through all of your best friend’s recent camping trip photos, you’ll see more of his or her posts in your feed later in the day. 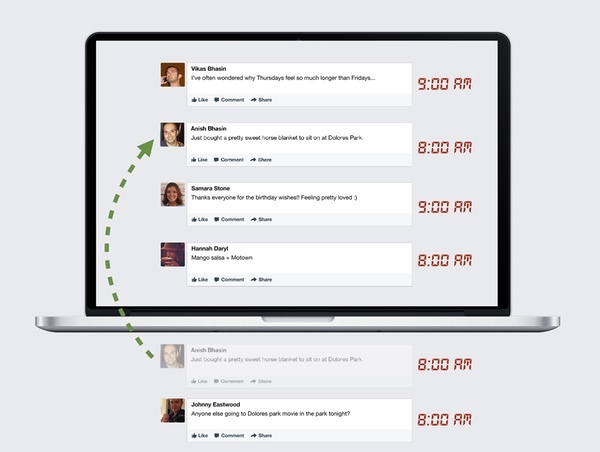 Facebook’s updates will effectively eliminate boring, non-engaging stories from the news feed. As a personal user, this is an awesome update. Show me the stuff I actually want to see, right? However, as a marketer managing a fan page, this update is a little worrisome. For A LOT of brands with Facebook fan pages, the barrier to reach their audience just became way more extreme – because their pages are, well, boring. For the brands with thousands to millions of followers, even the slightest decrease in “reach” can have a huge impact on their exposure over the social network and in many cases, even affect revenue. The average Facebook user only sees 20% (or less) of the 1500 potential stories filtered through their news feed every day. To stay in that 20% of what the users actually see, brands are either going to have to create much more engaging content or pay up to promote their posts. If someone engages frequently with your page, that person will see a lot more of your content so one-off engagement is not going to cut it anymore. Brands need to interact with their users on a regular basis to stay relevant. 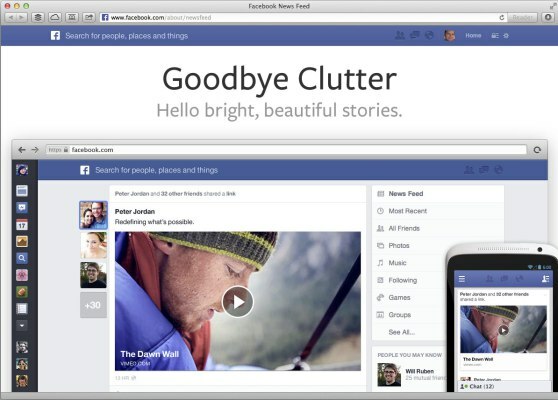 Don’t let the update to the Facebook news feed have a negative effect on your brand. In fact, it should inspire you! Now, more than ever, you need to ask yourself, “how can I make my posts more engaging?” The short answer is – use visual content. Visual content is exploding on social media. Posts with photos get 53% more likes, 104% more comments, and 84% more click-throughs. Social media data expert Dan Zarrella tracked and analyzed more than 1.3 million posts from the 10,000 most-Liked Facebook pages and found that photos drives the most engagement, followed by text and video. Below is a snippet from Dan’s infographic. Using photos will increase fan engagement and, in-turn, help make your posts more popular on Facebook. Read 7 more reason marketers should use images. Facebook is giving stories that may not have been seen during a user’s first scan of their news feed, a second chance to resurface – make sure your story is one of them! It’s come down to A) Be more engaging or B) Dish out the $$$ to be seen. 380 billion images were taken last year alone, making it clear that every marketer needs to embrace, and yes, LOVE images in social media. If you’re not sure why you should love images, these 7 Reasons will help clear things up. These numbers alone should be the only indicators a marketer needs to start using images in every single one of their social media posts. Images grab attention, tell stories, and convey emotional elements, which make them resonate with users longer, stimulating engagement, and maximizing shares. Facebook’s Edgerank algorithm, which determines what users see in their news feed, is based on the activity and engagement your fans have with your content. If your fans are not engaging with you, they are not going to see most of the things you post. Using photos in your social media posts will increase engagement dramatically. (Refer back to #1). BONUS – if you are engaging your current fans, you will tap into “friends of fans” and increase your reach up to 34 times over. No matter what social media platform you are using, getting your posts seen by your fans should be your top priority (if it’s not, you shouldn’t be on social media). Even if you are in a time crunch, simply posting some text to get a new message out will no longer cut it. Find an image that ties in with your message. In fact, 90% of information transmitted to the brain is visual content. Research conducted by Pagelever revealed that the “average post” only reached 7% of its fans daily. Increasing your engagement with images in social media posts will increase your visibility. People prefer visual content and consequently Edgerank prefers visual content. Follow in the footsteps of big brands with lots of fans. Companies that are utilizing images in social media posts are seeing HUGE results. 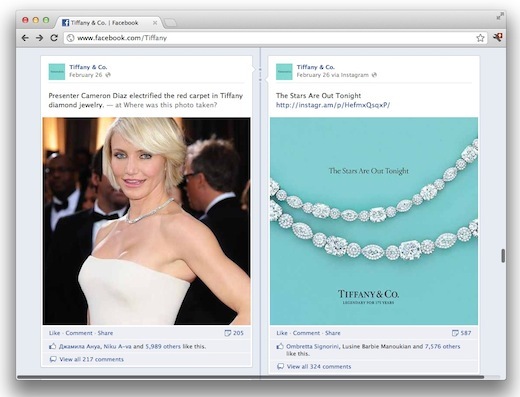 One month after the introduction of Facebook timeline for brands, photos saw a 65% increase in engagement. See how many posts you can find on Oreo’s fan page that DON’T include images – it will take you a while. Link previews are not engaging. Link previews pull thumbnail images that are small and hard to see – making them easy to overlook in the news feed. If your goal is to drive traffic, you need to be noticed! Highlight your posts by using large images to showcase your content. When choosing your image, make sure to choose something that is intriguing on it own, relevant to what your content is, and will instantly grab the attention of whoever sees it. In a study of their own Facebook posts, Hubspot found that posts that contained a photo and a link received 84% more link clicks than the “regular” text and link posts that had no photo. There are plenty of royalty free, creative commons images out there to choose from, so don’t sweat it if you don’t have your own image to use. Symphony has an exclusive built-in image search feature that suggests images when you don’t have one or can’t find one you want – saving you from ever having an ugly post again. People prefer consuming visual content. Those same people are your potential leads and current customers. When is the last time you have logged into Facebook and not seen a SomeEcards image? Pinterest now boasts over 70 million users and Instagram has 120 million + monthly active users who post 45 million photos a day. Facebook users share 300 million images each day. That’s a lot of people connecting with images! Symphony, the best social media tool for image lovers, was developed to help you maximize the power of your social media presence. Not only does Symphony have exclusive features to help make every one of your posts more beautiful and engaging, it’s an an all-in-one dashboard to curate, publish, monitor, and manage all of your social media content. Join our community of image lovers and make your online presence your most powerful marketing asset.